Not quite sure what you call it…. but it is a scrumptious little treat! Does anyone remember these little gems from their childhood? A simple mixture of crunchy chow mein noodles, butterscotch chips, peanut butter, and dry roasted peanuts make a treat that looks like a tiny little haystack and is just the right mixture of sweet and salty, crunchy and creamy. I made these for a “Wizard of Oz” party, thinking they were just the thing to do with the leftover “straw” that fell out of Scarecrow. With our without the peanuts… with or without the peanut butter. Some add a bit of vegetable oil. Some add a a mixture of chocolate and butterscotch chips. Here is how I made them. And if you haven’t tried them, they are definitely worth a try! Super easy and super yummy! Add bag of chow mein noodles and peanuts and stir gently until all noodles and peanuts are coated and ingredients are well combined. Working relatively quickly before mixture cools, drop by tablespoonfuls onto wax paper or parchment paper. Allow to set for several hours. Store in an airtight container at room temperature or serve. 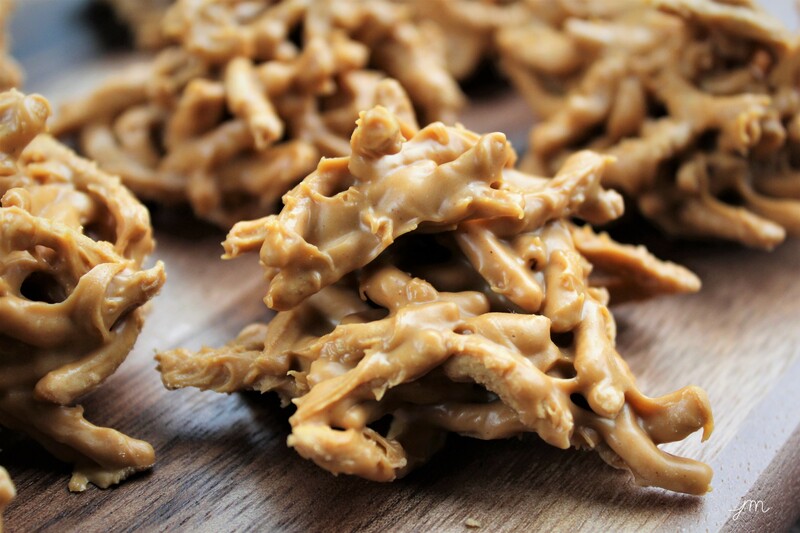 My mom used to make these and always called them “Hawaiian Haystacks.” We loved them, and thanks for the recipe! These look delicious and would make great egg nests for Easter. Yes they would with tiny bird eggs or jelly beans in them. Whatever you call them, I’m happy to eat them! I do remember these from my childhood and I haven’t thought of them in years! They are so yummy!! Looks great, thank you. I don’t think I’ve ever had these. My Gram made something like this with all of her wee “helpers” long, long before the noble microwave made it’s appearance! I remember the peanut butter and “twigs”, the rest is a mystery to me now. What I do recall is the fun we had in the process and in the consumption of the results! Thank-you for this sweet recipe and a trip down memory lane!! This is an oldie but a goodie Jodi! Thank you for reminding me of this fun easy treat, going on our menu!! The kiddos will love these! We are having a cookie exchange at my next book club, these will be perfect! One person is a vegan, this looks vegan, right? But I’m also bringing your pumpkin snickerdoodles, I just have to!! wooohoo! Hope they are both hits!!! Let me know 🙂 What is the book you are discussing? Oh yes. Duh!! Sorry. I’ll have to get it. You won’t regret it! Just mesmerizing. I got it on audible and just listened to the first chapter on a nice hour-long stroll with Charlie this morning. You are right – drew me in right from the start! Listening to the author read it with such passion is really enjoyable. I want to savor it and save it for my walks I think as it is so enjoyable! These are a favorite of mine! You have my taste buds watering again! What a great idea. Perfect for a party snack! Jodi you always have the best snack ideas. I am amazed at how quickly the time goes in retirement. I’ve started a little grant-writing enterprise, and I am busier than I ever expected to be with that. But…much of my time crunch is self-created. I’ll have to play with the idea of twice a week… a food post and a ‘life’ post? Good ‘food’ for thought, Jodi! ooooo I like it!!! no pressure – but…… hehe – love your writing. Don’t make yourself too busy! But ENJOY and choose things you love to do. Lucky lady!!! It’s that ‘love to do’ part that makes me think about writing more! Who cares which it is? I love the idea of this. I have always loved these and also, the white chocolate version of these!! Yummy and you did a great job for the Wizard of Oz treats; all of them! I’ll bet you would like it!! !